We take a look back at the unique footwear from the Wildcats' 1996 Championship season. In Lexington, Kentucky basketball is religion. The Wildcats boast the most wins, the highest winning percentage, and most continued NCAA Tournament success of any college team. With those accolades comes a certain degree of tradition. Rick Pitino’s 1996 team roared through the season and dominated the tournament—each of the first four games was won by over 20 points. The squad, which featured Derek Anderson, Tony Delk, Walter McCarty, Ron Mercer, and Antoine Walker, was stacked. 10 of the players went to the league. When the dust settled, the Wildcats returned to Lexington with the school’s sixth NCAA championship. And, the team did it all in one of the most polarizing uniforms in college sports history. Typically, Kentucky wears royal blue. The 1996 team, however, bucked the norm. 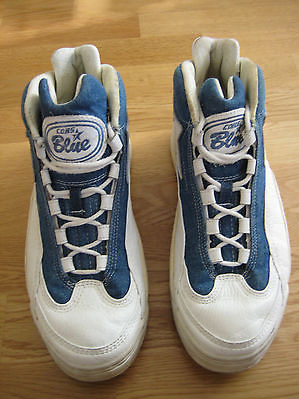 Supplied by Converse, Pitino’s guys rocked a bizarre denim look—faded out and married to a unique shoe, the Converse Cons Blue. The look was debuted on February 11, 1996, against Arkansas. During the tournament, it became legend. Long before denim became a normal set-up for casual colorways (ex. various LeBrons), the Cons Blue (and related uniform) proposed a radical look. 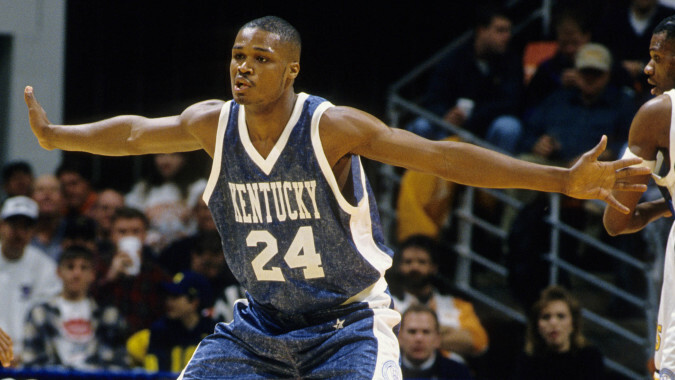 It wasn’t the first time Kentucky put the WILD in Wildcats; that happened during the ‘93-’94 season when the team wore an outlandish stripe. However, the denim kit ranks up there with the early 1990s tie-dye sported by the New Jersey Nets. Bold makes sense. A facsimile of a famous fabric on basketball uniforms? That’s just plain insane. There were many forgettable team shoes in the 1990s. Included in that bunch was the other shoe worn by Walker and co., the R.A.W. Energy. While not bad, the model hasn’t experienced the same nostalgic celebration as its Nike and Reebok cousins. Moreover, Converses performance legacy from the period has become a footnote (despite the outfitting of some truly iconic teams) in basketball footwear history. Success, kids, doesn’t always lead to legacy. Yet while Converse’s shoes haven’t risen in an Internet-fueled revisionist history, the Cons Blue remains an outlier. Can you recall another true team signature shoe? How about one that isn’t the famed Nike Terminator? The design of the Blue, featuring authentic blue denim panels, marked a willingness to change and a desire to forge a new era of Kentucky basketball. Pitino certainly succeeded. His vision, made reality by Converse, challenged Lexington’s conservatism with successive uniforms and thrust the Wildcats back into the national conversation. How much did the championship mean in 1996? A whole lot; it was the first for UK in 18 years. Pitino returned to the finals in 1997. Missing out on a repeat, he skipped town for the challenges of the NBA, taking a job with the Boston Celtics. The memory of his success, three Final Fours from ’89 to ’97, has outlasted the faded denim look. Today, it seems foolish, if not simply dated. But, it shouldn’t be forgotten. When it comes to reflecting on NCAA glory, teams and players with unmistakable swagger are most regularly remembered. Bibby wearing Foamposites. The Fab Five and their black socks. Acie Earl’s towering flat top. The ’96 Wildcats certainly didn’t need a signature look to cement their particular attitude. But, thanks to coach Pitino, the guys got it. Go Big Blue, at least for one winning season, had a whole new meaning.